After Oil Spill, Coast Guard Prepares To Open Houston Ship Channel : The Two-Way Environmentalists, meanwhile, are worried that the spill happened at the worst possible moment — the peak of birding season. A barge loaded with marine fuel oil sits partially submerged in the Houston Ship Channel on Saturday. As the Coast Guard prepares to open the Houston Ship Channel after an oil spill over the weekend, environmentalists were trying assess the damage to a sensitive ecological system. The Associated Press reports the Coast Guard is hoping to reopen "one of the nation's busiest seaports Monday." "Authorities are still trying to determine how much oil spilled Saturday, when a barge carrying about 900,000 gallons collided with a ship. Initial estimates were that as much as a fifth of the barge's cargo spilled. "By Sunday, oil had been detected 12 miles offshore in the Gulf of Mexico. Twenty-four vessels were working to skim the spilled fuel and deploy containment booms." In a press release, the Houston Audubon Society says the spill happened at the peak of the birding season, when more than 100 species of birds are resting, foraging or breeding in a nearby sanctuary. The Houston Chronicle reports the Society has spotted more than 50 oiled birds. "We expect this to get much worse," a spokeswoman for the Society told the paper. "By Sunday afternoon, oil was washing up on the northeast end [of] Galveston Island. "Clumps of the tarlike substance coated rocks and coastline along Boddeker Road all the way up to the East Beach Jetty. "Booms that had been placed in the water Sunday morning had been pushed to shore by wave and wind by the afternoon. "In some areas, the orange barriers had been coated black and flattened by the oil. In other points, farther east, no barriers had been placed at all." 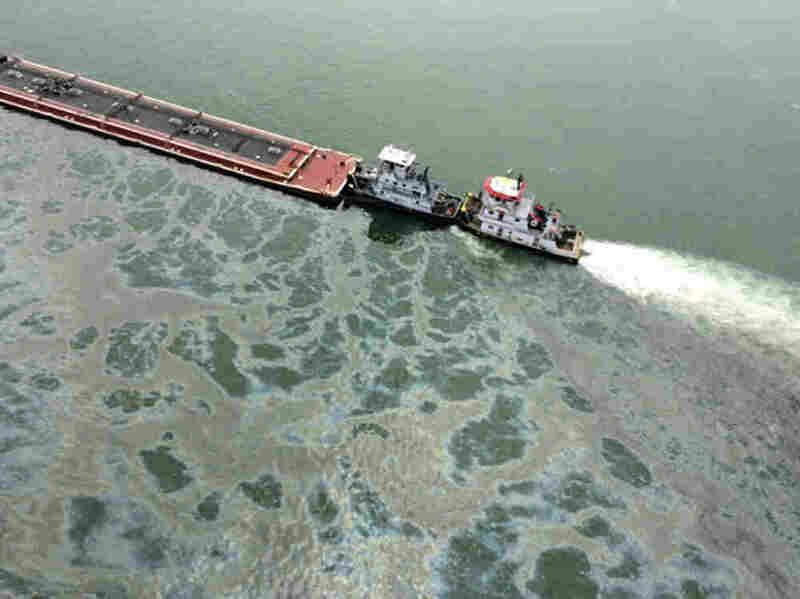 The Houston Chronicle reports that the agencies handling response to the spill estimate about 168,000 gallons could have spilled into the Ship Channel. For some perspective, BP's Deep Horizon oil rig spilled 210 million gallons of oil into the Gulf of Mexico back in 2010. The Exxon Valdez incident spilled 11 million gallons.